Why choose Cedar Springs? Is Reverse Osmosis the same as Distilled water? When is my next delivery day? What time will the driver be delivering? How does Cedar Springs reduce their carbon foot print? Absolute vs. Nominal Filter? What is micron size? Which is better? Spring water or filtration? Sleeve vs. Enclosed Filters? What is a 'precoat' design? What are Volatile Organic Chemicals (VOC's)? What are Trihalomethanes (THM's)? What is Reverse Osmosis (R/O) system? What is the term for filtration rentals? How can i refer-a-friend and receive $25? Why is Glass more expensive? How should I handle Glass Bottles? Where do we get our water from? Why is the water more than it is in the store? Are our plastic bottles safe? What type of plastic do we use? First payment is due upon delivery. If you are available to accept delivery payment can be cash or you can leave a cheque payable to Cedar Springs Water. First payment can also be billed to your credit card prior to delivery. Cedar Springs' future payment terms are net 30 days. Payments can be made by cheque, credit card, through Internet or telephone banking. Our customers can also be set up on preauthorized payments or automatic credit card payments. There is a $10.00 refundale deposit for each plastic and glass bottle. On the initial set up we deliver 4 bottles at which time a $40.00 deposit is required. The bottle deposits carry over to your new bottles as we deliver water to you and pick up an equivalent number of empties. The bottle deposits are refundable to you if you decide to cancel, provided the terms and conditions of your agreement are met. Courteous and reliable drivers Environmentally conscious We stay in touch with you, by emailing or calling you in advance of your delivery day to make sure we meet all your water needs. A complete line of products for all your needs. Follow the leader to your best glass of refreshing spring water anywhere. VALUE: Why spend 70 cents or more per glass for soda or juice when Cedar Springs is only pennies a glass? TASTE: Discover why Cedar Springs is quickly becoming the fastest growing bottler of spring water today... "It's gotta be the taste". No calories, award-winning great taste, good for you. SERVICE: Our philosophy is a company-wide commitment to every single customer. We listen to what our customers need - your input is appreciated - and then we do whatever it takes to surpass these expectations! SOURCE: : Every drop of Cedar Springs water originates from the deep natural springs nestled in the picturesque and unspoiled area of Oro Township, Ontario. Naturally filtered, naturally great! CONFIDENCE: Every Cedar Springs' customer can be confident that their water has undergone the most comprehensive and uncompromising tests to ensure every glass is the purest around. Reverse osmosis is not the same as distilled water. Both are filtered municipal water but the method of filtration is different. Reverse Osmosis filtration forces water through a fine membrane where only pure water molecules get through while distilled water is the collected steam when water is boiled. Both distilled and reverse osmosis contain a TDS (total dissolved solids) of less than 10 ppm (parts per million). Distilled water has a typical TDS of 2-5 ppm, whereas Reverse Osmosis has a typical TDS of 3-7 ppm, making them virtually indistinguishable from one another. As a comparison the TDS content of spring water is typically between 180-440 ppm. Our drivers normally deliver between 7:30 am and 5:00 pm Monday to Friday. Cedar Springs is very conscious of preserving our environment, by nature of our service and our Company philosophy. The best filters are 'absolute' filters. Most filters are 'Nominal' filters which diminish in performance as they are used. If a nominal filter removes 99% of particles 35 micron and larger at the beginning, it will gradually remove less and less over time. The 'Absolute' filters are better because they are made up of a mixture of different carbon types that prevent the filter from losing quality as water goes through the filter. Everpure filters supplied by Cedar Springs are 'Absolute' filters, removing 99.9% of "absolutely" all particles 0.5 micron size and larger throughout the life of the filter without any performance deterioration. Filters will state that they remove particles x micron size and larger. To understand how big a micron is a good example would be a human hair which is 100 microns. It is a personal preference, comparing the two products would be like trying to compare apples to oranges. Our bottled water is from a government certified protected source where there are no farmlands or commercial industries in the surrounding area. Cedar Springs uses two independent laboratories along with daily in-house testing to ensure the quality of our water. Filtration systems may be an effective cost and space saving alternative for some customers. Municipal water from Lake Ontario has chlorine, fluoride and other possible contaminants in the water. The selection of a high quality filtration system is very important. Cedar Springs offers premium quality filters that effectively eliminate chlorine and harmful cysts such as Giardia and Cryptosporidium, assuring you of safe, clean and great tasting drinking water. Many filters are sleeve filters, which means that the filter is removed from a sleeve and a new filter is inserted into the same sleeve. Cedar Springs' offers three styles of filters. Everpure and 3M enclosed filters; the filter and cartridge are one sealed unit and are completely replaced with each filter change. The CBR2 sleeve filters are an economical sleeve filter, popular in offices. Everpure revolutionary 'precoat' design is a special filtering method that combines mechanical filtration (removing particles) and adsorption (removing volatile organic chemicals) in one. Most filters on the market do one or the other. The effectiveness of the filter also depends on the amount of time water is in contact with the filter material. This 'precoat' design from Everpure has a larger adsorption area than ordinary block carbon filters in the market. It uses an exclusive pleated filter membrane coated with a proprietary bland of activated carbons to allow for maximum contact time with incoming water without compromising water flow. Organic chemicals that evaporate easily and find their way into our water; they come from products such as pesticides, herbicides, hairsprays, cleaning agents, varnishes and paints. Compounds formed in drinking water when chlorine reacts with organic matter occurring naturally in the raw water source. Recent scientific studies reported associations between THMs and colon cancer, bladder cancer, birth defects, low birth weight and miscarriage. Reverse Osmosis offers mineral reduction in water through a process of filters and membrane technology. It uses a membrane that is semi-permeable, allowing only water molecules to pass through, while rejecting the particles that are too large to pass though the membrane. Not all Reverse Osmosis systems are effective. The effectiveness of a Reverse Osmosis system depends greatly on the quality of its components — especially its pre-filter cartridges and the membrane itself. Lower quality pre-filters may lead to premature membrane fouling, as well as reduced performance, water output, and membrane life. Cedar Springs installs Hydrotech® Reverse Osmosis drinking water systems that are equipped with the patented Smartap® water quality monitor which compares the feed water to the product water and accurately indicates membrane performance with the touch of a button. The residential Reverse Osmosis unit offers Faucet Smartap™ that illuminates every time water is drawn from the faucet indicating membrane performance and inlet valve operation. This leading edge technology brings integrity and credibility to our customers by means of continuous monitoring. Cedar Springs initial term is 36 months. After the initial term is completed the agreement renews on an annual basis from date of filter change. Water in glass bottles is a personal preference and definitely not everyone’s choice. Our Cedar glass bottles are imported from Italy. Bottling water in glass is much more time consuming and labour intensive, all the way from the bottling line to completing the actual delivery. The larger bottles are still the most inexpensive way to purchased bottled water in glass when compared to single-serve sized bottles. Carry them indicidually with one hand under the bottom and your other hand at the base of the neck under the safety seal for support. Full bottles should not be stored touching one another on the floor. When two full glass bottles bump against one another, there is a risk of cracking and / or micro fractures that may not be evident until bottles are moved. At Cedar Springs we offer Natural Spring, Reverse Osmosis and Distilled water. Our spring is located north of Horseshoe Valley Ski Resort in the hills of Oro Township. Our Reverse Osmosis and Distilled waters are 100% fully filtered municipal water. Cedar Springs uses only food grade plastic water bottles made of virgin poly-carbonate resin. The Canadian Food Inspection agency monitors all the products we use in the production of our bottled water. You can be secure knowing that our bottles are not boiled at any point. They are sanitized with food grade products within an enclosed area. We also offer Glass bottles as an alternative. The plastic water bottles that we use are Health Canada approved reusable poly carbonate. Ensure the spigot/faucet assembly is tight. To accomplish this turn entire faucet clockwise. Also, ensure the disc beneath the lever (tab) is also tight by turning it clockwise as well. 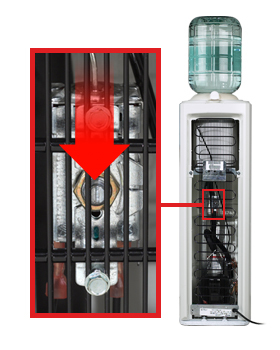 If your cooler does not contain a safeguard, the cause of a leaking cooler may be that the reservoir is overfilled before inverting the bottle. If so, this may cause an improper seal allowing air to enter the system resulting in leakage. Pour the water in the defective bottle out and using a black magic marker clearly mark the bottle with an "X" or put a crumpled up piece of scrap paper inside the bottle to ensure that it will be destroyed when returned to our plant. Please contact our customer service department at 416-798-7675 to inform us of the defective bottle, a replacement bottle will be sent at no charge on your next schedule delivery. If after 30 minutes the reservoir drains, the cooler is the cause of the leak. In this case contact our customer service department at 416-798-7675. If you are finding the water is not as cold as you like it, or too cold, and/or has recently stopped cooling you can adjust the thermostat to correct this problem. You may also need to adjust your thermostat if you notice no flow of water through your taps. An ice block may have been created in the reservoir of the cooler. Ideally, the easiest tool to use when adjusting the thermostat is a flat-headed screwdriver. If this tool is not available you can also use a butter knife, a letter opener, or anything resembling these items. A metal grill will be covering the thermostat, but angling your tool will allow you to adjust the screw. Turning the centre screw of the thermostat clockwise (right) will make the water colder. Turning the screw counter-clockwise (left) will have the opposite effect, and will make the water warmer. Turning the thermostat too far to the right may result in the cooler freezing, and you will know this because there will be no water flow through your taps. Please allow thirty to forty five minutes after adjusting the thermostat for the temperature to change. If after this time has passed and there has been no change to the temperature of your water please phone our customer service department at 416-798-7675. In order to enjoy the award-winning taste and quality of our water, we recommend cleaning your cooler by using the convenient CoolerCare Kit or the method below. By cleaning your equipment on a regular basis, you take an active and vital role in maintaining the high quality of your cooler. Upon completion of a bottle of water, unplug the cooler and remove the empty bottle. If your cooler is fitted with a Safeguard or non-spill system, remove this by turning it to the left and lifting out. If your cooler is of an older style, gently pry around the rim of the safeguard with a flat-headed screwdriver until it lifts up sufficiently to pull it from the cooler reservoir. Remove the baffle from reservoir. The baffle will be either a blue or white plastic disc with a funnel. The baffle can be washed in warm soapy water, being sure to rinse thoroughly. If there is water inside the reservoir, drain all of the water out through the tap(s). Save for future use if you wish. Pour 1 cup of vinegar and 3 cups very hot water into the cooler reservoir. Using a clean cloth, sponge or dish brush, clean the entire inner surface of the reservoir. If calcium build-up is severe (white coating in reservoir or flakes in water) allow solution to sit in the reservoir for an hour or so and then scrub the reservoir. Drain solution out through tap(s). Rinse out the reservoir by filling it with clean water, and then draining out through the tap(s). If you have two taps, alternate taps as you drain. Rinse with clean water until there is no taste and/or odour of vinegar. To further sanitize, you may mix 1 teaspoon of bleach into 4 litres (1 gallon) of water in the reservoir of the cooler, let stand for 5 minutes and drain out through the tap(s). Be sure to thoroughly rinse the solution out by repeating step 6 until no odour of bleach remains. Reinstall cleaned baffle and Safeguard system, then place a new bottle on the cooler. The outer panels of your cooler can be cleaned using a mild soap and water solution. Never use an abrasive cleanser on any surface of your cooler. Make sure all exterior surrounding areas are dry before plugging the cooler back into the electrical supply. Tap "Add All", and then tap the calendar to which you want to add the ICS calendar file events, and then tap "Done"